Even though chicken tikka masala with rice and naan bread is not typical camp food, Alex took a risk to prepare this meal for a dining hall full of hungry teenagers. The results were better than he expected, actually one of the best new recipes he has tried at camp. Alex, head cook at the Clearwater Site at Ontario Pioneer Camp, one of Inter-Varsity Christian Fellowship’s nine camps across Canada, is a 3rd year student at Tyndale University studying religious education and general ministry. He grew up going to a variety of camps. At the age of 16, he started working at Circle Square Ranch Severn Bridge. He helped out in the kitchen, led small groups, and was the camp videographer/photographer for five years before serving as head cook. 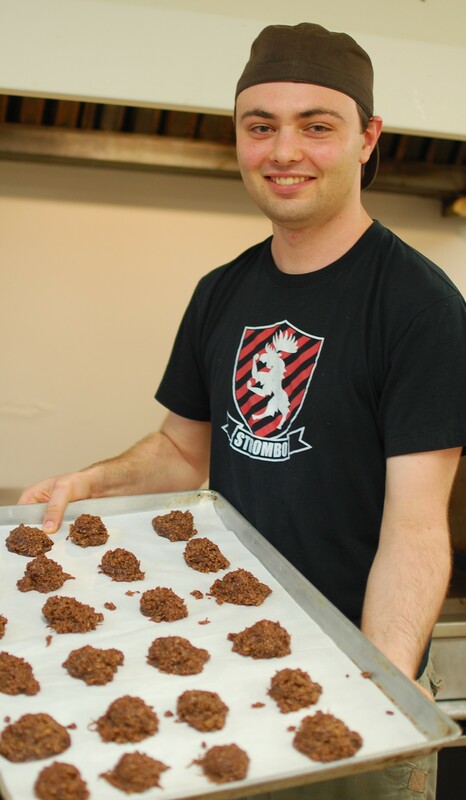 In 2011, Alex moved to Ontario Pioneer Camp to cook for the Leaders-in-Training and Woodland Challenge teen programs. “It can be very busy cooking for hungry teenagers, I have long hours! But they’re very appreciative that somebody is here who can provide them with food,” says Alex as he takes a break from the kitchen to talk to us. He is the creative mastermind behind the kitchen counter, preparing three meals a day, seven days a week, for three weeks at a time for the teens on site. He takes care of everything from setting the menu, to filling out food orders, to making sure everyone gets fed, especially campers with special dietary needs and allergies. He has a pretty good grasp on how to gauge a group’s interest, what recipes they will like and which ones won’t work. At camp, there are no plugs, no cords, no chargers, no cables and no screens. Campers and staff are asked to set aside their electronic devices so they can focus on all that camp has to offer. We spoke with Calvin Bennett, National Director of Inter-Varsity’s Camp Ministry (East), and asked him to share some of his thoughts about why kids benefit from unplugging at summer camp. Face-time instead of Facebook. Instead of being glued to their screens with “friends” on social media platforms like Facebook, they have face-time with other campers while waiting in line at the tuck shop or goofing off in the dining hall. Without the trappings of texting, Twitter, and Instagram, campers are free to focus on building relationships with someone right in front of them. They learn how to meet new friends, have a conversation in person, and work through conflict with others. Engagement instead of entertainment. Even in the quiet moments, while kids are waiting for something, they have learned to reach out for a device to stay entertained. Calvin says, “I see increasingly there isn’t room in people’s lives to hear from God. At camp, kids are given time and space to hear from God and think about things.” In quiet moments around a camp fire or during time with their chalet/cabins at night, without the opportunity to escape into virtual reality, campers have time to engage with the important questions of life. Activity instead of apathy. The increasing use of entertainment revolving around screens means kids are adopting a sedentary lifestyle. Gone are the days where they ride their bikes around the block; kids are more likely to want to stay inside and resign to staring at a screen. At camp, instead of mind-numbing apathy, kids get active running around and being out in nature. For parents who are concerned about being just a text message away from their children at camp, we encourage you to trust the staff to be in touch when necessary and to allow your kids the opportunity to work through the struggles they face at camp on their own. Kids gain confidence when they go through the process of problem-solving in a safe environment with mentors guiding the way. As for the rest of the year when kids are in their regular routine, one of the things that Calvin has found helpful is to set limits on the amount of time and the times in the day when his family has “screen time.” Much like in a camp setting without technology, screen-free times allow space for conversation and community to form. Going away for overnight camp for the first time might be pretty nerve-wrecking for you and your kids. Instead of looking forward to all the fun they’ll have jumping in lakes and learning to ride a horse, you’re losing sleep over what they’ll eat at camp and whether they will make any friends. In order to calm some of your pre-camp jitters, we asked Andrea Richardson, camp director at Circle Square Ranch Brantford in Ontario, one of Inter-Varsity Christian Fellowship’s nine camps across Canada, for some advice on how to prepare for overnight summer camps – for your young campers, your older campers, and for yourself as parents. Arrange for your child to sleep over at a relative’s house for one night, then try two or three nights. Make sure there is no parent contact with the child – this might be harder for you in the end! But it gives your child practice with the sleep-away experience in a more familiar setting before they get to camp. 2. Practice living out of a suitcase. When your child is at camp, she will need to know where to put her dirty laundry and where to find her pajamas. Practicing with a suitcase at home helps her learn these skills before she is in a cabin full of other girls and their stuff. 3. Practice putting on bug spray and sunscreen. It might be easy to overlook these simple tasks, but they are things that campers have to do several times a day at camp. Get easy-to-use bottles that enable kid-friendly application. 4. Talk about when to ask for help in resolving conflicts. Some kids will struggle with poor peer dynamic all week and wait until they get home to talk about it. Encourage your child to talk to their cabin leader or counselor when they feel upset. Leaders are trained to help kids work through conflict and ensure that everyone is having a good time. 1. Help them prepare for the break from technology. One of the great things about being away at camp is the chance to be outdoors and interact with other kids. But this might be an adjustment for kids who are hyper-connected on their electronic devices during the school year. Talk about the benefits they can gain when they take a break from their screens. 2. Remind them that rules at camp may be different than rules at home. Your kids might be used to a certain bedtime or wake up time at home. When they are away at camp, they will have to live by the camp’s schedule and rules. In order to have a good time at camp, they need to learn to respect a new set of rules. 1. Stay positive when talking with your kids about camp. On a first call home, parent shouldn’t offer to come and get the child – if they do, the kid will take them up on it. Once it’s on the table, it’s hard to take back. Instead, help your kids remember the positives of the day. Congratulate them on their successes so far. Assure them that everything at home is fine. Avoid statements like “I miss you so much too, I don’t know how I’ll last to Saturday.” Someone has to be sure things are going to be okay, and it’s going to have to be the parent. 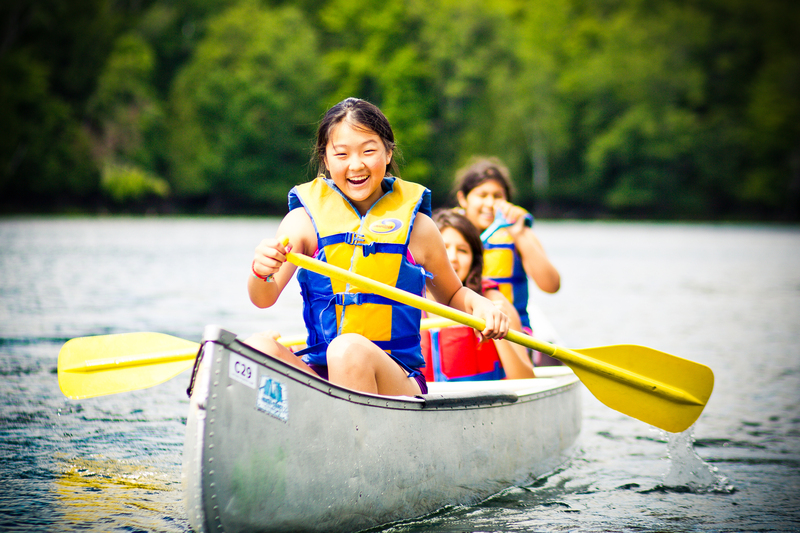 Who knew that a week away at summer camp would create so many opportunities for learning – not only do kids get to learn how to paddle a canoe or take care of a horse, they also get to learn life-long skills like asking for help and taking care of their belongings. If you haven’t signed your kids up for camp, there’s still time! Visit our camps’ websites for more information. Have a fun and safe summer!